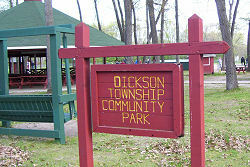 This park is a huge resource for a small town. The park is mostly shaded, offering a pleasant place to recreate on a hot summer day. 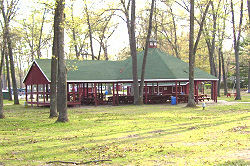 The CCC Park on Lake Eleanor is just two short blocks away, offering a place for the kids to swim within walking distance. 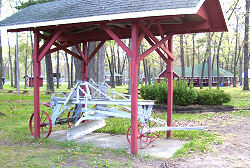 There is a small, horse-drawn grader on display at the east end of the park. 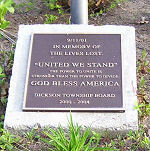 There is a plaque at the base of the flagpole that reads,"9/11/01, In memory of the lives lost, 'United We Stand,' The power to unite is stronger than the power to divide, God Bless America, Dickson Township Board, 2000-2004." Restrictions- no camping, no glass bottles, no noise 11 pm to 7 am. 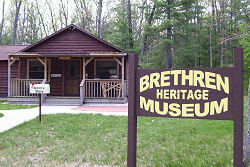 From Manistee, take M-55 east for 15 miles to Highbridge Road. Turn north. Brethren is reached in 6 miles. Turn east on Coates Highway. The park is reached in 4 short blocks.